Does the induction program at your club incorporate the National Employment Standards? The NES consist of ten (10) minimum standards of employment that cannot be altered to the disadvantage of the employee. In addition to the NES, an employee’s terms and conditions of employment generally come from an award or agreement. 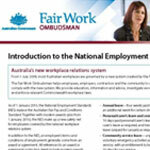 You can find out more about the National Employment Standards (NES) by visiting the website of the Fair Work Ombudsman. The Club Training Australia online induction program for registered clubs in Queensland incorporates the National Employment Standards (NES) to ensure that your club complies with the Fair Work Act 2009.